Here’s a guest post by a talented college application essay writing coach named Ethan Sawyer. I love what he shares about how important it is to have both an engaging story at the start of an essay, and then a key insight that reveals what it meant. A great insight, to wow us, or at least let us know why you told us the story. The same is true for your college essay. Some college essays I’ve read have the story but not the insight, some have the insight but not the story, and some have neither. Very few have both, especially in the first draft. So I want to share a quick example of what NOT to do, then give a few tips on developing a great story and a great insight, and finally leave you with an example of what you SHOULD do. Here we go. As I was walking, I saw a bunch of kids running toward him. They ran at him, knocking all his books out of his arms and tripping him so he landed in the dirt. His glasses went flying, and I saw them land in the grass about ten feet from him… He looked up and I saw this terrible sadness in his eyes. My heart went out to him. So I jogged over as he crawled around looking for his glasses, and I saw a tear in his eye. As I handed him his glasses, I said, “Those guys are jerks. They really should get lives.” He looked at me and said, “Hey thanks!” There was a big smile on his face. It was one of those smiles that showed real gratitude. I helped him pick up his books, and asked him where he lived. As it turned out, he lived near me, so I asked him why I had never seen him before. We talked all the way home, and I carried some of his books. He turned out to be a pretty cool kid. I asked him if he wanted to play a little football with my friends. He said yes. We hung out all weekend and the more I got to know Kyle, the more I liked him, and my friends thought the same of him. Over the next four years, Kyle and I became best friends. Never underestimate the power of your actions. With one small gesture you can change a person’s life. God puts us all in each others lives to impact one another in some way. 2) Delete it and act like it didn’t touch your heart. Tomorrow is a mystery. Today is a gift. I hope you all have a blessed day and lots of gifts ahead of you. Interesting opening! I’m following the story for about, I’d say, the first two-thirds, wondering what’s going to happen, what the narrator will learn, etc. Then we get to the insight, or what I call the “so what.” And, in my humble opinion, it’s pretty cheesy. While suicide is no joke, the lesson at the end reads like a Hallmark card: Never underestimate the power of your actions. With one small gesture you can change a person’s life. God puts us all in each others lives to impact one another in some way. Could this have been a great insight? Maybe! But the way it’s expressed doesn’t quite work. What does this have to do with your college essay? I think a great college essay needs both a great story and a great insight and that we can learn a bit about both from the story above. Just tell the frickin’ story. Y’know, like you’d tell it to a friend. What do I mean? Well, I think many students feel obliged (thanks in part to AP English class) to put a thesis or moral of the story at the end of the first paragraph. But you totally wouldn’t do this in life. Imagine, for example, starting a story to a friend with, “Little did I know, the lesson I learned that day on the soccer field would serve me for the rest of my life and shape the person that I was to become in several important ways.” Heck no! Just tell the story. End specifically rather than generally. I know, you’ve probably been told it’s good to relate the ending of your essay to something larger, or even universal. But don’t force it. And if your essay has lots of juicy specifics and details, chances are you’ll find something specific that has the potential to represent the universal. Want an example of an ending that’s both specific and universal? Here’s one from my favorite essay ever, the “I Shot My Brother” essay (and yes, he really shot his brother). 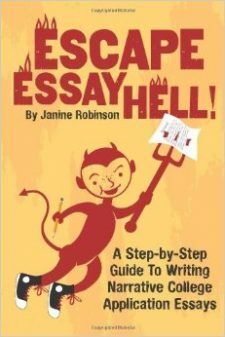 At the bottom you’ll discover four tips for an amazing essay. BONUS TIP: You don’t have to spell out the final insight! In fact, the best essay endings aren’t. Here’s one more amazing example essay about a dead bird.